As I mentioned yesterday, Hammer sat on their hands for a while after getting the rights to The Devil Rides Out before actually making the film, because they weren’t sure that they’d be able to get its garishly Satanic content past the censors. 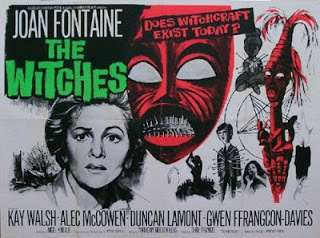 As it turns out, however, it wasn’t the first time Hammer would try to depict occult sacrifice and pagan orgies onscreen – 1966’s The Witches got there first. For a while, Hammer enjoyed a partnership with American production company Seven Arts, who as part of the deal would occasionally pay for major Hollywood stars to appear in Hammer films. For example, The Nanny featured Bette Davis, being part of the string of thrillers she made after What Ever Happened To Baby Jane? revived her career. In the case of Hollywood veteran Joan Fontaine, Seven Arts provided not just a big name to take a leading role, but a full-blown creative partner – for Fontaine owned the film rights to Peter Curtis’s novel The Devil’s Own, which provided the perfect material for Hammer to adapt with Fontaine co-producing.